The online conferencing tool from Cisco Systems has plenty of cheaper competitors, but lots of businesses still use it. 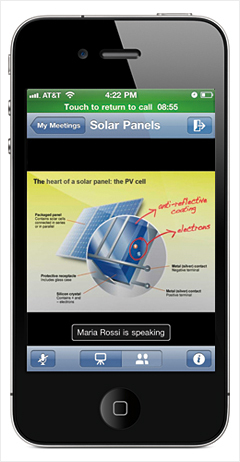 The mobile version lets you easily join meetings (you must be a paying WebEx subscriber to initiate calls), share documents and presentations, and chat with other participants. Added perk: Transfer a meeting from phone to computer midcall with a flick of the wrist. Free on iPhone/iPad, Android, and BlackBerry devices.